Bruker® XRF Gun Takes 3 Seconds per Scan! So much in the world depends on the properties of true stainless steel. Improper alloy grade substitutions can result in hazard and industrial failure. You need to be certain that you are using, buying or selling the right steel grade, compliantly manufactured and correctly labeled. 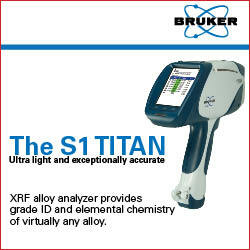 Bruker’s stainless steel testing X-Ray Fluorescence (XRF) guns afford you this certainly. Contact us via the form on the right to find out how Bruker’s handheld analytical equipment can serve your specific steel grade verification tasks. Clearly, stainless is the queen of the steel alloys, the most durable and resistant, and correspondingly costlier than the others. Because they are specifically chosen for their superior properties, stainless alloys must be standards-compliant and accurately labeled. As steel testing experts we have often seen steel items marked “316L” that proved to be one of the lower, cheaper stainless steel grades, or to contain lower grade component parts. Though such situations can be due to fraud, most alloy grade errors are banal, caused by suppliers’ inadequate material management or reliance on inaccurate steel analysis equipment. Bruker’s handheld XRF guns for testing stainless steel offer an easy and reliable solution that efficiently solves the problem of steel grade mix-ups. 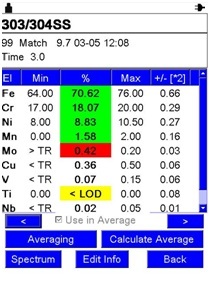 (Note, however, that XRF is “blind” to carbon, so it won’t help you distinguish between 316 and 316L stainless steel, but it is able to differentiate the vast majority of stainless steel grades.) Please do not hesitate to contact us with questions about using a portable XRF solution for your stainless steel testing. Stainless steels are classified based on their properties. The stainless steel alloy groups are as follows. Stainless steel is completely recyclable. Steelmaking is a lucrative industry dependent on to the availability of affordable stainless steel scrap. Interestingly, stainless steel objects and construction are today composed of an average 60% recycled steel, out of which amount some 40% is made up by recycled EOL (“end-of-life”) products, the other 60% provided by manufacturing processes. Accurate Steel Grade Verification. There is a shortage of good stainless steel scrap. Top quality scrap costs the most, but the buyer must depend on stainless steel testing equipment to be certain that the scrap he is buying is the real deal. Scrap Upgrading. The steel mill pays for scrapper minimum guaranteed concentration. A pile of stainless steel scrap containing 304 with nickel content of 8-12% is resorted into two new piles, with 8-10% and 10-12% Ni respectively, the latter pile being priced based on 10% Ni, a substantial gain. Penalty Avoidance. “Tramp” elements in stainless steel may incur penalties for the seller. These can easily be detected and eliminated by resorting with the help a Bruker gun. A “tramp” or “trace” element is any chemical element included steel’s composition that was not added deliberately and is not easily removable. These impurities enter steel from ore and pig iron, via impurities in ferroalloy additions, refractories and, importantly, from scrap. Such common “tramps” presences in stainless steel that are not metallurgically reducible include phosphorus, vanadium, copper, tungsten, niobium, cobalt, tin, lead, and tantalum. Moreover, foundries are unable to reduce sulfur in stainless steel. All these elements must be rigorously scanned for. Luckily, a Bruker XRF stainless steel tester can “see” them all.) Today, professional steel scrap sorters by default rely on handheld XRF guns such as Bruker’s to identify and verify stainless steel grades. Reaching the steel mill, scrap is re-analyzed more meticulously. A steelmaker usually pre-sorts the material with an XRF gun and then tests a statistically significant sample from each scrap load with a bench top stationary spectrometer machine in a steel testing lab. Here is a table showing the penalty limits on tramp elements in stainless steel material. Above these limits, scrap steel will most likely see a significant drop in price. Needless to say, it isn’t all about scrap. 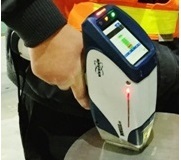 Steel testing with handheld XRF has numerous other applications in industry. Please contact us for more information or to receive a quote from Bruker Inc. If you have found this article useful, also browse our information pages concerning alloy steel testing and steel scrap testing. You may also be interested in carbon steel or/or low alloy steel testing issues.